Some time ago we included our Combi-Action™ button on Irish Day Tours‘ website, the major single day tour platform in Ireland. 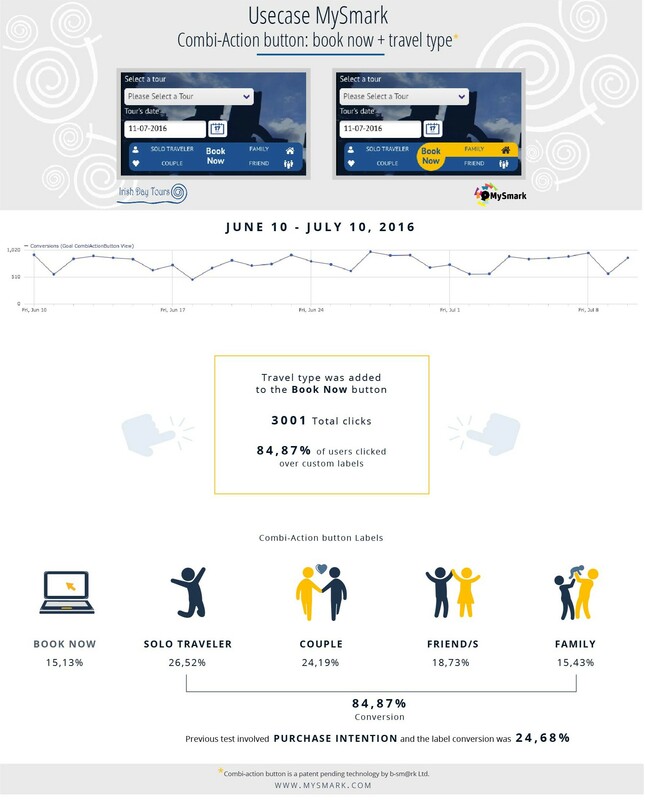 Through this technology we monitored the booking conversion while adding a special flavour of ours: as visitors were booking, they could even communicate the reason of their trip, or their purchase intention. We already stated why knowing purchase intention is key for a business: on this occasion, the button performed well as users who clicked over the additional labels of the button were almost the 25% of the total. Choices included I’m Curious, It’s a good deal, It’s top of my list and I am Trustworthy, and helped the business understand if the main drivers for booking were related to the price/quality feature, the trustworthiness of their brand, or the attitude of their customers. But 25% wasn’t already enough for us: the project continued and some changes were made to the labels of the Combi-Action™ button. In the new version, tourists can state their travel type, whether they are travelling alone, with family, friend/s or their partner. Results were beyond our expectations, as users who chose to book while clicking our labels were the 84.87% of the total. Not only the Combi-Action™ button labels performed very good, but users who clicked just the plain Book now option were the minority (only 15.13% of the total). In addition to that, the website revealed to be visited mainly by US tourists, while among the Europeans the ones who choose this company the most are British, Spanish, French and Germans. Travel mates Combi-Action™ button can be a great way to generate personalisation in your online travel website. Learn more HERE and get in touch with us.